Spring 2018 - Collaboration with Zach Bachiri and Katherine Herzog. As part of a Service Design course at Carnegie Mellon, we were asked to design a service for music over a six-week period. My team designed Rhythms, a service that improves sleep quality through the intelligent, responsive use of procedurally-generated music at home and on the go. To see our full process, read our blog post on Medium. Based on these findings, we decided to pursue a service that leveraged the customization potential of procedurally-generated music (algorithmic composition of musical excerpts based on various inputs) to create individualized sleep routines. Our initial research covered a broad range of topics, investigating music both as a product and as a tool. 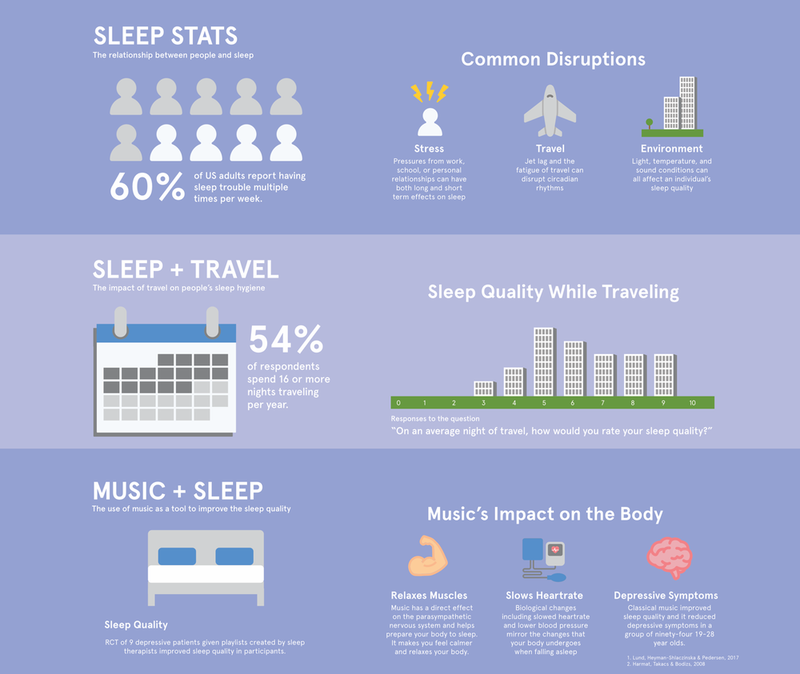 After exploring the intersection of music and health, we discovered that music has been proven to positively impact sleep, and chose to design a service that leverages music to improve sleep quality. After reading research about the positive effects music can have on quality of sleep, we were excited about designing a service that makes leveraging the power of music to improve sleep easily accessible for consumers. To better understand this problem space, we conducted additional secondary research, surveys, competitive analysis, and expert interviews. Through our secondary research and an expert interview with a University of Pittsburgh sleep researcher, we learned about the science of sleep and the ways that music could aid sleep. Numerous academic studies show the positive effects music has on sleep, but a key component is the qualities of the music. Generally, the consensus was that music with low dynamism, majors harmony, and mid-to-low frequencies is ideal for aiding sleep. These factors made us consider procedurally generated music as an option. There are many factors that contribute to “sleep hygiene.“ As we expected, physical environmental factors, like light, sound, and ergonomics, play an important role in quality of sleep. We learned about other dietary and cognitive factors that can play into quality of sleep. Specifically, patients with insomnia are discouraged from reading in bed, as it trains the brain to stay awake while in bed. The big takeaway for us was the importance of developing a sleep routine. If our service can help users develop a routine that promotes good “sleep hygiene,“ we will be able to improve quality of sleep. In our surveys and secondary research, we discovered a connection between travel and a lowered quality of sleep. Traveling disturbs your sleep routine and introduces new environmental factors, creating an unfamiliar environment that is harder to sleep in. We saw our service as an opportunity to facilitate a consistent, familiar sleep routine that carries through from the home to the hotel. We decided to move forward with the design of our service by developing a series of design scenarios which centered around in-home and on-the-go use of music as a sleep aid. Throughout our design process, we were continually updating an in-depth service blueprint. This allowed us to maintain multiple levels of zoom of the service especially as changes to individual touchpoints were made. As we developed this concept further, we continually zoomed in and out from designing the individual touchpoints of the service (mobile app, packaging, hotel TV app, marketing site) and the service experience as a whole. The touchpoint we focused on developing first was the mobile app, which acts as the users “command center” for Rhythms. We generated a wireframe prototype to test with users. Coming out of our research phase, we had narrowed in on designing a service that allowed users to develop a sleep routine, aided by procedurally generated music, that could be taken on the go. As we were wrapping up our research we were also creating some potential service scenarios to help explore the space. Walking through the design scenarios, we identified the mobile app as the service's primary touchpoint and began the prototyping process by building out a series of wireframes. This encompassed several workflows including onboarding, an introductory period in which the service learns about a user's sleep patterns, the average day-to-day interactions, and accommodations for travel. To identify potential weak points in the user experience and interface design, we created clickable mobile prototypes and tested them with potential users. We received positive feedback about the look and feel of the mobile application and the instruction card. The information on both was clear and easy to follow. The participants expressed that the writing was relatable and concise. They were looking for a little more clarity about where to set up the hardware and how to understand the data. It was easily resolvable with our instruction sheet and improvements with the final iteration of the application. Through iteration and refinement of our concept, our team developed a service that includes both an at-home and on-the-go experience, supported by a mobile application, physical hardware/sensors, and an in-room hotel television app. While our process was very iterative, it impacted the way we saw our ecosystem as well. As we made changes to individual touchpoints, we had to consider the impact on the larger service experience, how those changes impacted the other various touchpoints, etc. With the progression of the project. The value flow map helped to crystallize the relationships and sub-groups involved in our service and encouraged us to put into words the true “value” in each exchange. Specifically, it allowed us to see the moments in which our users are most actively engaged with the service alongside the moments where Rhythms takes a back seat. A Rhythms user’s first experience with the service is the physical packaging. When they sign up, they receive a package including their bed sensor and instructions to get started. We designed packaging that plays off of the sleep theme, placing the materials inside a hand-sewn pillow. The Rhythms mobile app is the command center for the user. Here, they can activate their sleep cycle at night, schedule trips, receive notifications about bedtimes, and review their sleep score data. The interactive prototype can be found here. Once the user receives their Rhythms sensor, the app walks them through syncing up their sensor, going through a 7 day observation period where Rhythms learns your sleep habits, and finally introducing music into their sleep routine. To begin using Rhythms, the mobile app walks the user through the process of setting up their sensor and syncing it to their mobile device. After completing this process, a week-long observation period begins in which Rhythms tracks the user's baseline sleep patterns in order to build a custom music regimen. On an average night at home, the user can open the Rhythms app to begin their sleep routine. This triggers his or her custom, procedurally-generated music, which plays as the user falls asleep and fades out when motion is no longer detected. If a user becomes restless throughout the night, the music fades in and out to ease them back to sleep. To improve the efficacy of the custom music regimen, Rhythms periodically prompts the user to rate the quality of their sleep the night before. Each night, the user can initial their sleep routine in the Rhythms app. Procedurally generated music begins to play and fades out when they fall asleep. Throughout the night, Rhythms is taking input from the bed sensor and will fade music back in if the user becomes restless throughout the night. If the user has set an alarm, music gently wakes them at the optimal point in their sleep cycle before their set wakeup time. Users are also occasionally prompted to rate their night of sleep to help Rhythms better calculate a user’s sleep score each night. Rhythms collects and compiles sleep data so that users can review daily, weekly, or monthly reports on the quality of their sleep. These reports include a "sleep score" calculated based on input gathered from the in-bed sensor as well as the user's self-assessed ratings. Users can view their sleep data in the app. Rhythms calculate a sleep score based on the input from the amount of restlessness throughout the night and the users daily ratings. Users can see these score on a daily, weekly, and monthly range, with varying degrees of detail. Users can indicate in the Rhythms app when they are going on a trip. If they are traveling to a different time zone, Rhythms will suggest gradually changing bedtimes to prepare the user for their trip. If staying at a participating hotel or Airbnb, Rhythms users can simply sync with the in-room hardware. Guests at participating hotels can also use Rhythms through the in-room sensor and TV app. If a user chooses to schedule a trip to a different time zone in the app, Rhythms will suggest an adapted sleep schedule, gradually adjusting to prepare for travel and alleviate jet lag. Users may also choose to stay at a participating hotel or AirBnb, where they can simply sync their Rhythms profile to the in-room hardware to enjoy their home sleep routine. While we developed the packaging and the mobile app much more in depth, there were other touchpoints in our service blueprint where we only began to imagine the exact rendering. We designed an example mockup for the Rhythms marketing site, TV app, and researcher portal to help imagine their further implementation.